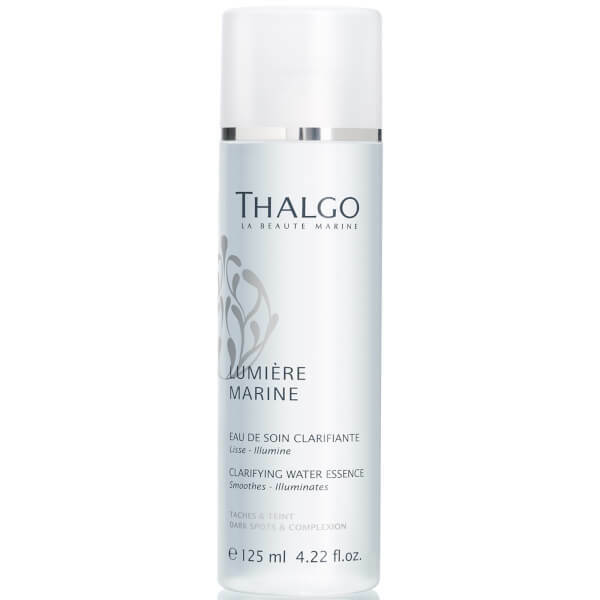 Drawing on the riches of the ocean to develop exceptional skin-enhancing products, experts in marine skincare and spa therapies Thalgo presents the Clarifying Water Essence: a refreshing treatment water with a slight gel-like consistency that refines uneven skin tone and instantly smooths skin. Plumping skin with moisture-replenishing ingredients White Agaric extract and Hyaluronic Acid, the radiance-boosting lotion unleashes the multitude of skincare benefits that antioxidant-rich Brown Algae extract has to offer, from maintaining skin’s optimal moisture balance to firming loose skin and addressing pigmentation and dark spots. Imparting a cooling relief, the aqueous solution leaves you with a more uniform and naturally luminous complexion. Apply morning and evening, using the fingertips, to clean, dry skin, before your serum and moisturiser. Aqua (Water), Glycereth-26, PEG/PPG/Polybutylene Glycol-8/5/3 Glycerin, PEG-8 Dimethicone, Hydroxyethyl Urea, Butylene Glycol, Fomes Officinalis (Mushroom) Extract, Ribose, Diglycerin, Maris Aqua (Sea Water), Phenoxyethanol, PPG-26-Buteth-26, Pentylene Glycol, PEG-40 Hydrogenated Castor Oil, Hydrolyzed Hyaluronic Acid, Undaria Pinnatifida Extract, Aloe Barbadensis Leaf Juice, Macrocystis Pyrifera Extract, Sodium Polyglutamate, Hydrolyzed Yeast Extract, Chlorphenesin , Balanites Roxburghii Seed Oil, Parfum (Fragrance), Glycerin, Niacinamide, Adenosine, Ethylhexylglycerin, Propanediol.